Anticipate the needs of your clients, increase client retention, streamline reporting and gain access to the audit tools you need to manage regulatory compliance. Manage all your data in one place; not just client data, but also the data of other subsidiaries, partners, referral sources, business units and legal entities. Enjoy a 360 degree view of client acquisition and service information, enabling you to anticipate client needs and increase client profitability by capitalising on cross-sell and up-sell opportunities. Never overlook engaging with your clients, and ensure timely touch points, with Workbooks activity management capabilities. Keep up with financial reporting standards and gain access to real-time management and business information with the Workbooks reporting engine. Manage compliance using the Workbooks audit module. Automate key client touch points such as client support case management. Benefit from full integration with your accounting package, minimising the risk of manual error or duplication of effort and ensuring consistency of data across the business. Synchronise your Outlook calendar, meetings, tasks and contacts, ensuring all client communication is captured by your CRM. Manage email campaigns, events and conferences, and accurately measure the return on your marketing investment. 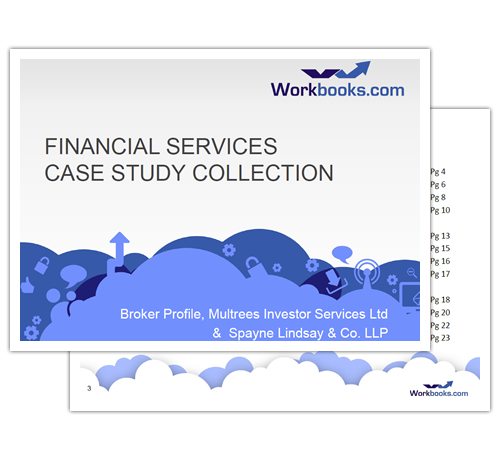 Download the Financial Services case study collection to find out how Workbooks has transformed business for other firms.